13 Feb Cool Desires’s Colorful Space In Downtown Cruz Bay Now Cooler with New Shade! A new Vitino umbrella goes up over a picnic table at Cool Desires. Click on image to play video. Philomen Richards and her friend Mary both are incredibly thankful and humbled to have made their way through the storms. When back-to-back hurricanes Irma and Maria battered St. John, now almost six months ago, Philomen’s house made it through, but Mary’s was destroyed. ¨It’s hard,¨ she says, building and filling a home over decades to watch it wiped away. Still, her family was safe and for that she is thankful. Philomen’s attitude is the same and shared widely among the island’s residents. Philomen originally arrived in the U.S. Virgin Islands 48 years ago from St. Lucia, another gorgeous Caribbean island to the south. 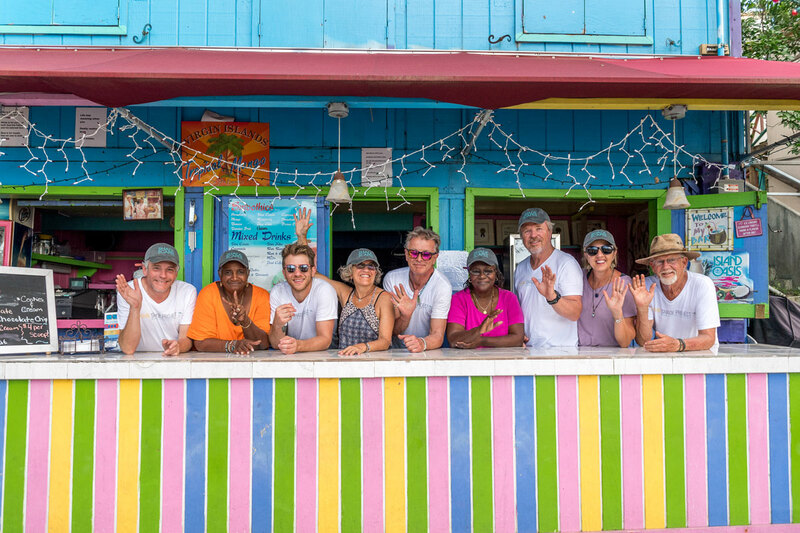 She has been running her smoothie and drink stand for almost as long, over 30 years, in the same location overlooking the Virgin Islands National Park Dock and Visitor’s Center. Mary was helping at Cool Desires, on the strip below Mongoose Junction, when the St. John Shade Project arrived to install their two new table umbrellas. 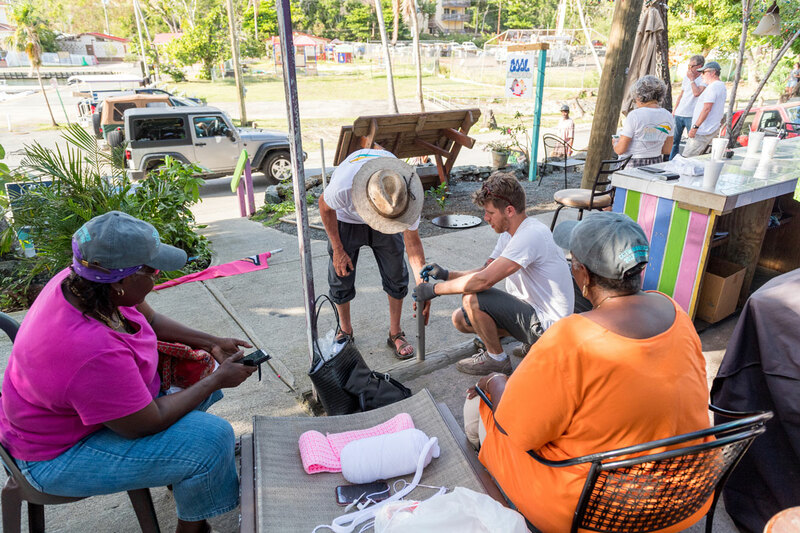 Jo and Philomen had picked out the size and color together, to match the shop’s bar stools, when they met during Jo’s December trip to talk to restaurant owners about the St. John Shade Project. Meeting Philomen is a joy. Her effervescent personality, big smile, and warm hugs are always ready to greet her repeat customers and newcomers alike. Her colorful shop with open-bar seating is an enticing spot for anyone who desires something cool, hence the lovely name Cool Desires. The area had some shading before the storms, but like most places on St. John, the hurricanes took much of that shade away. St. John Shade Project workers prepare to install one of two umbrellas. Day or night around town, Philomen’s place is always inviting. And now she’s thrilled to have her two new umbrellas making her place even more noticeable from the main street in Cruz Bay. Let’s not forget to tell everyone about Philomen being a Cruz Bay superstar! When we did our first post about the project on the Stateside St. Johnian’s Alliance for Hurricane Irma, an incredible Facebook page for 18,000 folks who love St. John to connect online, we included a photo of Philomen sporting a ShadeScapes ball cap. That photo proved she is very loved by locals and visitors alike–her photo received so many likes, comments, and shares that we couldn’t wait to share the post with Philomen when we arrived. She was so excited to hear about her fan club that she read every single comment and looked at all the names of those who had wished her well. Then she smiled and got back to her knitting, thinking how lucky she is to have so many people who care about her and her business, and who are ready to come back and visit soon! We loved spending the afternoon with Philomen and Mary, and enjoy seeing the umbrellas up every day at one of the “coolest” spots in town! NEWS UPDATE! Philomen and Mary were part of a Channel 9 Denver News segment about the St John Shade Project! The St. John Shade Project crew, Mary & Philommen pose under a freshly installed umbrella. Philommen of Cool Desires knitting while observing the crew installing her new umbrellas.